Hi Sylvie, what a cutie your reindeer is. Love the snowy scene and fab snowflake. Aaahhh!!! This looks gorgeous. Love it!! That is one cute little reindeer!!!! hi sylvie, this is gorgeous and ever so cute... 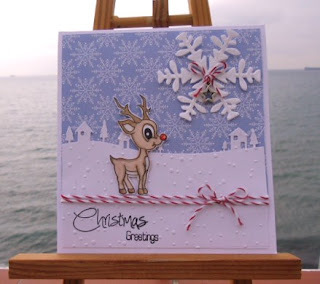 I just love the little rudolf image and the snowflake paper is fab too. Gorgeous Christmas card, just love that Memory box die, and your reindeer is a real cutie. Just as cute as it can be - Love the village and snowflake -- of course I love the besotted little deer -- well done!! Hi Sylvie, what a fabulous card! That red and white twine really finishes it off. Consider me your newest follower! What a cute card, so lovely!!! GORGEOUS!! Love the little scene you've made Sylvie.